To any of you who were perhaps planning on making a perfectly-spherical, intricately-detailed Epic Pac-Man Cake to Win the Internets: sorry, Toots. You’ve been preempted and one-upped by a half-assed* two-layer, sloppily-frosted banana cake. Omar K‘s friend Jennie owned all of you with the 66% execution and 153% creativity behind this Pac-Man cake she made for his birthday. The Ghosts were banana, white chocholate and cherry cupcakes covered in sugar icing. Everyone felt guilty eating them they looked so cute. * Relatively speaking. I mean, you’ve *seen* some of the cakes on this blog, right? Thanks for the link guys, the cake tasted awesome which is what really matters. I think the coolest thing about it was the ghosts. 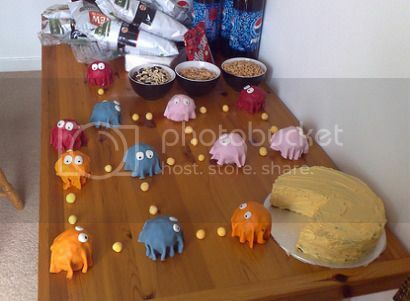 I so want this cake now… Omar, how did Jennie make those ghosts?